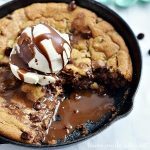 Chocolate Chip cookie dough, peanut butter cups, and chocolate chips are melted together in a mini skillet for a cookie recipe that is a dessert made for two. Divide cookie dough in half and press one half of dough into the bottom of the skillet and up the sides. Fill center with chocolate peanut butter cups and chocolate chips. Place the rest of the dough on top. Bake for 20-25 minutes or until edges are brown.